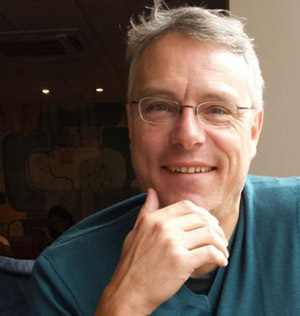 My guest today is Richard Skinner who I had the pleasure of first meeting at the Vanguard Readings which he organises in London each month, attracting big name readers and a loyal audience. Vanguard also has its own publishing imprint, Vanguard Editions. 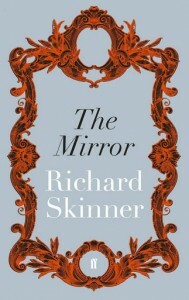 Richard is the author of three novels, all published by Faber & Faber. His work has been nominated for prizes and is published in seven languages. His poetry has appeared widely and his new pamphlet Terrace will be published by Smokestack in April 2015. 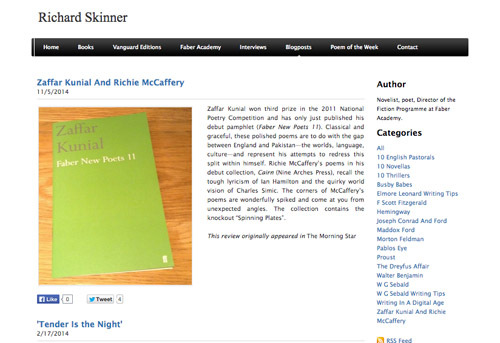 Richard is Director of the Fiction Programme at the Faber Academy. Do you have a blog or blog(s)? I do have a blog page on my website but it is not a standard blog, it is more of a place to post essays and reviews and anything else of interest to me. I think of it as both an archive and a resource. I have recently taken a lot of these posts down because they will be collected together into a book of essays, reviews and interviews that will be published in May by Zero Books. How often do you update it? Do you follow other blogs? I don’t update my blog in any regular way, just when I find/write something that I’d like to share. I follow a few other blogs, mainly by other poets, for example And Other Poems run by Josephine Corcoran, and Spectral Lyre. I tend to follow blogs when someone posts/tweets that a new post is up. Tell us what other social media platforms you use regularly. How do you manage the time you spend on social media – do you have any rules or tricks, for example? I am a regular user of Facebook and Twitter, which I use for both personal and professional purposes — the two often collide. I put time aside first thing in the morning to catch up on social media and then stop at a particular time in order to write. When I’m at home, I use my MacBook to post/tweet. When I’m out and about, I use my iPad mini (I don’t have a smart phone), but I can only use my iPad in WiFi hot spots, so I’m limited to when I can post/tweet (which isn’t a bad thing, I think). I just use the Twitter/Facebook interfaces. I did have Tweetdeck for a while but I didn’t find it particularly useful. 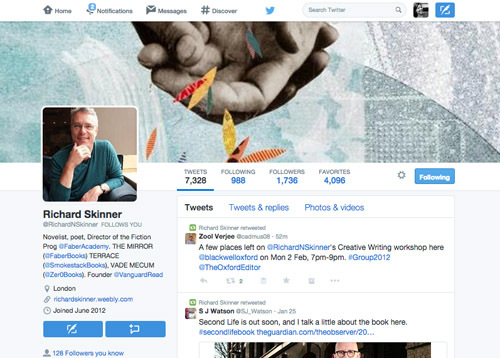 How do you balance social media activity with your actual writing – any advice? When I’m in the middle of a novel, I try to be strict with myself and only deal with social media at particular times. It doesn’t always happen though! One tip that works for me: I have set Notifications as my Twitter homepage, not Home. I have a large enough number of followers that it would be impossible to read every single tweet on my feed, and so, by setting my homepage as Notifications, I don’t miss tweets that have my handle in them. They are the more important tweets to respond to, I think. Some people find social media stressful. What do you most like about it what do you most dislike? I think there’s a lot of very dull/trivial stuff on both Facebook and Twitter (kittens! )* but there’s also some amazing stuff there, particularly on Twitter. I have come across some incredible photos, links, articles and so on, none of which I would have found otherwise.